With the ever-increasing number of humpback whales remaining in the whale watching tour area there are also more calves. 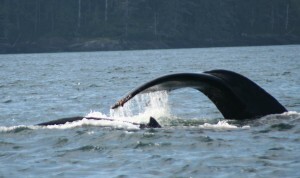 The number of whales normally viewed on a given tour day has increased from five or six whales six years ago to fourteen to sixteen this past season. The humpback calves are much more active than their mothers often spend time tail lobbing and breaching however it is the adults that provide the best classic whale tail photographs. Previous PostBest bald eagleNext PostWhat is a herring ball? This photo by Lynn Morris shows two grizzly bears, each eating salmon, and not being concerned with the closeness of the other bear. The abundance of pink salmon means that there are few disputes over fishing rights and those are settled without bloodshed. It is estimated that there are close to fifty grizzly bears in the Glendale River valley during the peak of the pink salmon run in September. The number of salmon means that all are able to obtain enough food without risking injury by fighting. 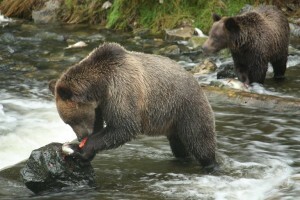 A dispute normally means that one bear will just move up of down river to another fishing area and still be able to catch enough salmon to satisfy it’s hunger.